I’ve been offline for a couple of days at the Society of Children’s Book Writers and Illustrator’s national conference, which was conveniently located in Los Angeles. 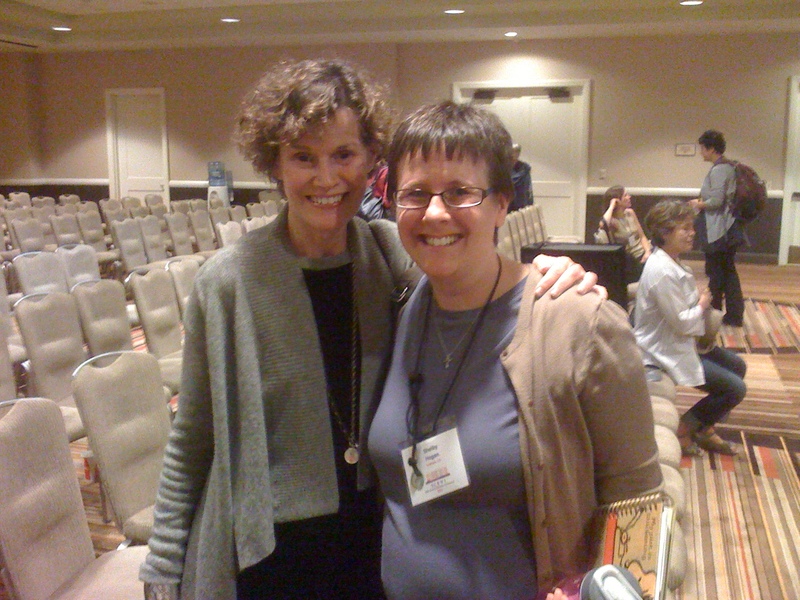 It was a power-packed weekend, but the absolute pinnacle of the experience (which was an excellent experience even without this) was meeting the person who inspired me to become a writer and whose excellent books carried me through good times and bad: Judy Blume. Why didn't I bring a REAL camera instead of just my phone??? Meeting my idol was a transformative experience. And also, she’s 73 years old. SEVENTY-THREE!!! I hope to look that great at 43! Anyway, I left the conference with a whole new perspective on writing and life. It’s been a great summer. What is the tackiest/goofiest/Goofy-est Disney accessory or piece of clothing you’ve ever bought or worn? Bonus points for photographic evidence! Girlfriend, you know if I had pictures I would be loud and proud to post them here. However, I don’t really think that I do. I’m trying to think of what the tackiest accessory/clothing I’ve purchased or worn, and I’m coming up blank. Which is really incredible, because when it comes to fashion I’m hopelessly inept and it’s just a matter of time before someone reports me to that reality show where they throw away all your clothes and buy you new ones that all match or whatever. I don’t count walking around in Mouse Ears to be tacky or goofy/Goofy, by the way. I think the ugliest item I’ve ever owned was a pink sailor hat. Prior to 1993, Disneyland had the Motor Boat Cruise in Fantasyland. In celebration of the ride, you could buy a sailor hat and get your name embroidered on it. When I was growing up, Shelby was not a very popular name, so I never got any of those personalized stickers or license plates or everything else that they sold with people’s names on them, so I think out of pure lack of access, I became a little obsessed with finding things with my name on them (which still persists to this day, actually). Even if they had to custom-embroider it, like a Disneyland hat, for example. So this little hat had a couple strikes against it. One, it was a sailor hat, so it was the round kind with the brim folded up, which was very campy. Two, it was pink. And not just a little pink either. I mean, it was A LOT pink. Think late 70s/early 80s pink. And three, back then you could only get embroidery in yellow thread. Now there’s nothing wrong with that per se, but yellow thread on the very, VERY pink hat looked odd, and slightly nauseating. I loved the hat, but in retrospect it probably wasn’t my fashion high points. And I don’t know whatever happened to the hat either. Sad. And a Mouse-in-Law question: If you could stay in any Disney World hotel and cost was not an issue, which would you choose? I honestly can’t answer this one because the only hotels I’ve spent any time in was the Dolphin for the conference (which isn’t even owned by Disney) and the Ft. Wilderness Lodge, DVC suites, where we were this past trip. The Lodge was fabulous and the boat to Magic Kingdom was pretty handy, but all in all, I have very little to compare it to. I would like to stay at the Animal Kingdom lodge or whatever it’s called with the room that looks out over the watering hole so you can see real lions eating real elephants right outside your door, but that’s basically because I’ve heard it was cool and it sounds cool. So the short answer is, I don’t really know. Would you go to Disneyland with me sometime? Hahahaha, you don’t HAVE to, ha ha. Sure, m’dear! Send me an email at MyYearWithTheMouse@gmail.com when you’re coming and if our schedules match up, I’ll try to make it over to the park for a meet and greet ;). And What’s your favorite disney movie? Why? Out of the animated movies, my favorite is The Lion King. I love it because it’s a great movie, but also because I have a lot of really awesome memories attached to it, and it came out at a particular point in my life where things were going very well for me, so I associate it with all kinds of happiness and pleasantness. It was also the first movie I actually went to see by myself, and that was because even though it was the discount theater near my college, my friends just eventually refused to go with me repeatedly. To be fair, I think I saw it in the theater at least 10 times. Oh, and funny story–I loved the soundtrack too, and of course it starts with the “MMMMMAAAAAAAAMAWENMAAMAMAAMEEMAMAAA” (you know what I’m talking about). So my stereo at time would use a CD as an alarm, and I thought it would be a fabulous idea to stick that CD in and have the song play so I could feel refreshed and inspired at the beginning of the day. What ended up happening instead was that song started playing and both me and my roommate were so startled that we both screamed and pretty much leaped out of bed. After that we used a regular alarm. And could you do a blog about the animation studio in California Adventure- the one with the ever-infamous Loop of Disney Movies? Its my favorite place in California Adventure. Ah, a Mouse-Next-Door request! I don’t want to commit. I have a lot left to do at Disneyland before I hit the MND, but I’ll see what I can do. And is there a limit with questions? Where are your favorite photo spots at Disneyland? What is your favorite line and least favorite line? I already mentioned that I don’t like Indiana Jones, but I actually do think it has the most interesting line. It’s got secret code on the walls and when the ride first opened, they were handing out little decoder cards. When the line was nice and long, it was fun to decode everything. My least favorite line is any bathroom. And Peter Pan. That line zig zags for.ev.er. What is (in your humble, yet so respected) opinion, the most underrated attraction at Disneyland? I’m going to have to go with Captain EO. And not because Theo has been referring to himself as “EO” since he can’t quite pronounce the “th” part. Captain EO was pretty remarkable when it first came out. Plus it had Michael Jackson on whom I had a massive crush. It opened in 1986 when MJ was at his peak, then closed in 1997, and re-opened as the “Captain EO Tribute” in 2010. And yes, the effects are hopelessly outdated and all of that, but you know, it’s nostalgia at its finest and it makes me happy to see Michael Jackson that way rather than his sad decline. If you are only at Disneyland for the day before you go back to Scotland or Canada or Albuquerque, then I wouldn’t call it a must-see, but if you’ve got some time on your hands and want to appreciate all the 80s had to offer, give Captain EO another try. What was your favorite thing at The Mouse in Law that they don’t have at Disney Land? EPCOT. The entire park. Minus Circlevision. Also the Rockin’ Roller Coaster from Disney Hollywood Studios. And I’d like to swap out our Winnie the Pooh for the MIL’s Pooh, and while I’m there I’ll grab the Peoplemover and Country Bear Jamboree and bring them back too. Shira also asked what my beef is with Roger Rabbit, but I’ll cover that when I do its blog entry :). In less than 2 weeks I’ll be back in the parks! Woo hoo! Thanks for answering! That alarm idea is very interesting… I must figure out how to do it. I loved reading all the questions and answers. You truly are a Disney expert and it’s definitely something I love to hear and talk about. I actually had a sailor hat (circa 1987) but it was white with yellow lettering. As a teen I seem to remember I felt sort of kitchy-cool with it. Not sure where mine ended up either. I’ve enjoyed your posts for several months as I try to keep a little connection to DL “magic” since I took my 7 year old in Feb. Most fan blogs are…well a little to “fanny” for me but as a mom of a 2 year old (my youngest) and natural cynic, yours is much more up my alley. I LOVED my white sailor hat! I wore that more than I ever wore ears at the park.